Of the maybe 100’s or 1000’s of pieces of clothing I’ve sewed in my life, there is nothing I’ve enjoyed as much as creating and constructing a wedding dress. It’s an unparalleled amount of work for a dress which is only worn for hours but remembered for years. 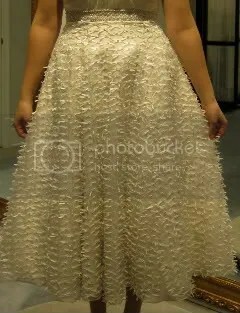 On my own wedding dress, I probably spent 100’s of hours beading and hand sewing. So why do I like this form of sewing so much? There is no logical answer. It can’t be the sense of competence because if you sew only one dress every ten years or so, you can hardly be considered “accomplished”. Circa 1970 – Dress #1. This dress was for my sister-in-law, who is still one of my dearest friends. A little short on cash, she was planning to wear a lovely borrowed dress. Did I simply want to make a dress, or was I altruistic and truly cared that she have a dress of her own? I talked her into going to a Swiss lace shop where we purchased fabric and Shiffili lace for about $50. 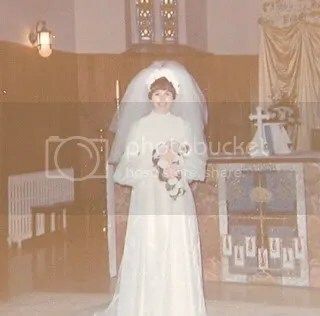 For the bride’s birthday that year, I surprised her with a headpiece and veil for which the internal framework was costructed with covered pipecleaners and the outside was made of lace scraps. She was so thrilled. Surrounded by bridesmaids and flowergirls adorned in lavender and purple, she looked lovely. Not to slight her husband, Ed, he looked great too. 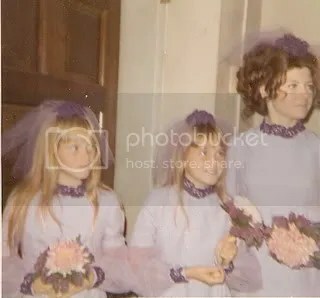 It’s so long ago that I can’t recall if I made some or all of the bridesmaid dresses. 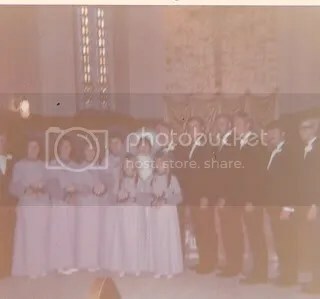 Now, nearly 40 years later, the small Instamatic photos have faded so it’s tough to see any of the dresses but I’ll keep looking for a better photo. Oh my, these photos scream of 1970. Why is the bride hidden? 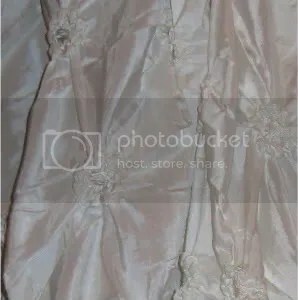 2010 – Dress #5. We’ll get to some of the other dresses at a later time, but it’s time to begin telling you about Megan’s dress. She will be married in June and we live a thousand miles from each other. As of now, I think we’ll see each other twice before the wedding. Now that’s downright frightening but I wouldn’t want her to know that I’m not sure how I’ll get the dress to the point of a perfect fit. (Just kidding, Megan). Step 1: Last winter in my excitement about her engagement and the opportunity to buy yet more fabric while on a day trip to New York’s fabric district, I found some bridal fabric Megan loved. 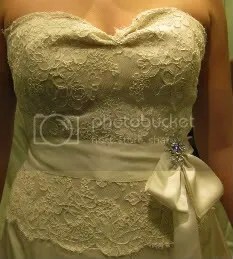 It’s been tucked away since that time awaiting the perfect dress. 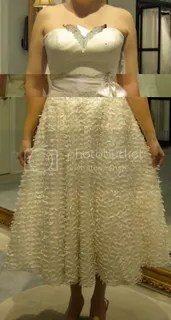 At Thanksgiving Megan visited and we went to several bridal salons to try on a few styles. The bridal salons generously offered us the opportunity to photograph Megan in the dresses. With her amazing creativity, Megan created a model from the photos – a satin top, rhinestone appliques, a sash and a skirt that looks nothing like the fabric we’re using. With the above style elements, this photo is where we are starting – follow for the coming months and we’ll all see how this turns out.